Firefighters work to control a forest fire on Dahinggan Mountains in northeast China's Heilongjiang Province, May 6, 2011. A forest fire that broke out Friday on Dahinggan Mountains in northeast China's Heilongjiang Province was extinguished early Saturday, said local authorities. The fire, which engulfed about 30 hectares of forest on Dahinggan Mountains, was put out by more than 5,500 fire fighters, said the authorities. They said the blaze was caused by a lightening strike and no casualties were inflicted. The fire fighters are still keeping a close eye on the burned area to rule out any possible fire risks. 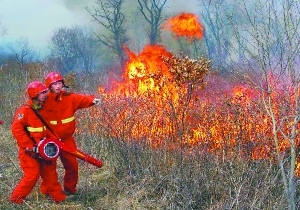 On Friday morning, more than 5,000 firefighters just extinguished another forest fire, which occurred Thursday morning in Jiayin County in Yichun City, Heilongjiang.